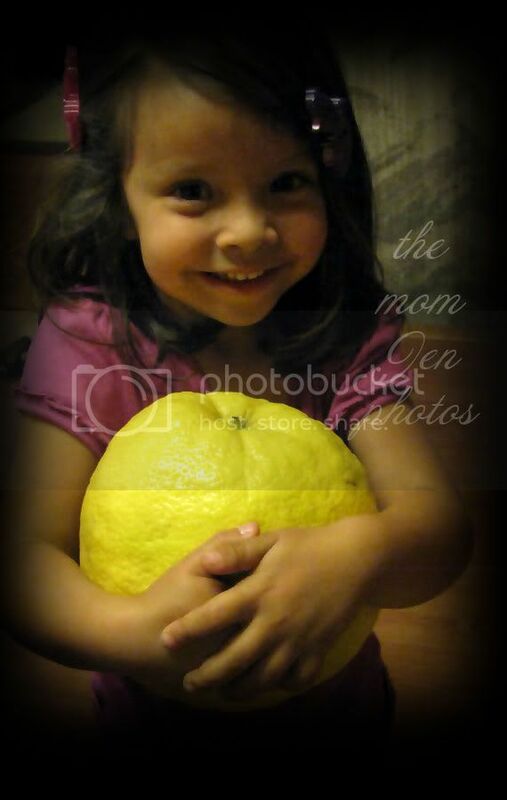 Musings of The Mom Jen: Lemonade? Lemon Drop? Limoncello? Home > Food, friends, K, Photos > Lemonade? Lemon Drop? Limoncello? This is a flippin' ginormous lemon from my friend's tree. It's bigger than K's head. When a friend gives you freakishly large lemons....make....? I had no idea they came that big!!! That is one big lemon. So what did you decide to do with it? That is a LEMON!?!?! Think I'd be tempted to make a helmet from it! Hehe! That thing is HUGE! What? That's real? Not photoshopped? Haven't made anything yet. My friend said it's mostly rind, I'll snap some shots when I cut it open! Lemon bars sound DELISH. Got to get rid of it quick, my hub is getting grossed out by the smell. If it helps, I've always wanted to try limoncello. hehe Can't believe how huge that sucker is! My husband had one like that a few years ago (his aunt gave it to him); he threw the seeds in a flower pot. We now have a lemon tree! Wow I have never in my life seen a lemon that big! WOW! Wow... even the lemons in our country have become obese. I see loads of lemonade in your future. Wow that is HUGE!!!! I didn't know lemons could get that big! Definitely either some lemon alcoholic drink and/or lemon bars! YUM! Holy hugeness. I had no idea an lemon could get so big. I vote some kid lemonade and some adult lemonade! ...lemon drop martinis made with Limoncello are the BEST! That is one AMAZING lemon! OMG, I have never seen a lemon that big in my life. No ideas what to make with??? Lemon pie??? Lemons can grow to be that large? I'm slightly intimidated by that lemon, seriously.